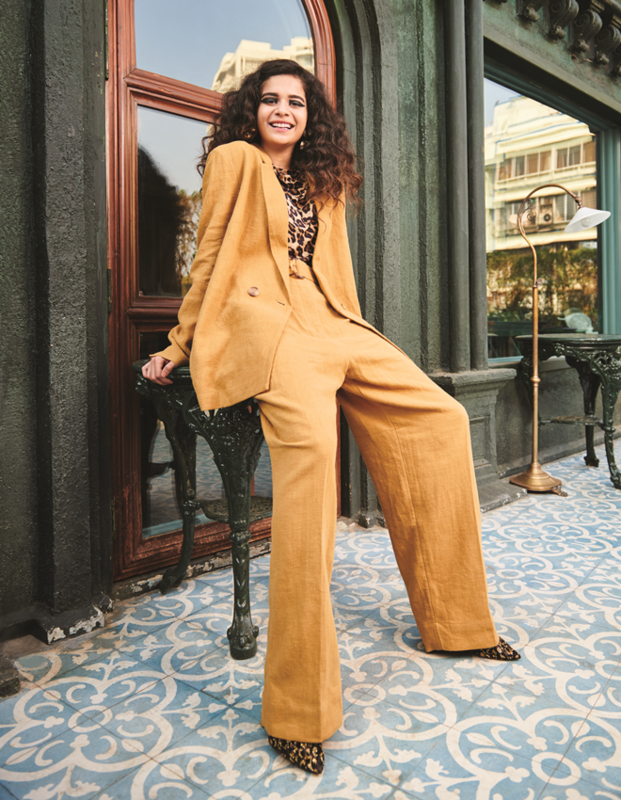 Move over Kim Kardashian — in our neck of the woods, 26-year-old Mithila Palkar is breaking the Internet and, as she tells me herself, it’s not because she is well-endowed. Unlike ‘klan’ Kardashian, or indeed many of the lovely local lasses we Google search the most, this millennial star hasn’t made it big by flaunting her figure. She is more craft than curves; a fact that will also ensure the longevity of her career. Before we dwell on the future, however, here we are in the moment with Mithila. Her staggering 1.5 million followers on Instagram — and several million more on Facebook — make an emphatic point in favour of her popularity. In the era of the influencer, these are enviable numbers, yet Mithila doesn’t identify with the ‘influencer’ tag. She has already reinvented the conventional Bollywood break and battled the odds to get there, but Mithila doesn’t see herself as a ‘disruptor’ either. “I’m just me,” she says, no strings or labels attached. With a beaming, beautiful smile that cannot be camouflaged even by Mithila’s munificent mop of curls, it is impossible not to be charmed by this pint-sized powerhouse. Seated in a sunny nook at Mumbai's Versova Social, we chat animatedly and she giggles often. She retells outrageously funny stories, but then asks to have them struck from the record. She is all about "keeping it real," but it is clear she cares considerably about public perception. Mithila is an artiste — an acclaimed one at that — but she is still learning how to be a star (which makes her infinitely more endearing). In killer Christian Louboutins for this shoot with THE MAN, Mithila cuts a fine figure, while confessing — from her 120-millimeter red-soled perch — that she doesn’t own a pair. Luxury indulgences aren’t quite her thing. 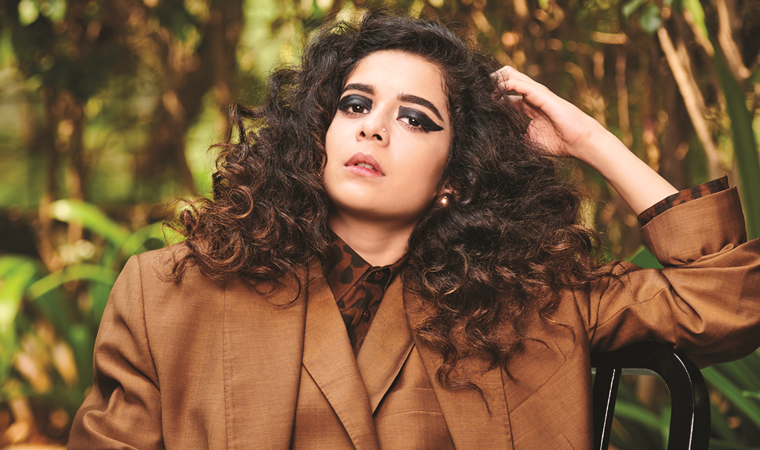 Between accompanying her 90-year-old grandfather on bank errands and shopping for groceries in Dadar, Mithila Palkar is the quintessential girl next door — and it is this relatability that makes her an online sensation. It has been only a few short years (read ‘three’) since Mithila shot to “fame” (a word she dislikes), with Hi Chaal Turu Turu — her Marathi version of the trending cup song performed by Anna Kendrick in Pitch Perfect. Four-and-a-half million views and counting, Mithila’s ‘gharguti’ experiment on YouTube set the tone for her entry into the entertainment industry. FilterCopy had already put her on the radar with a web series titled News Darshan, but when she landed the part of Meera Sehgal on Girl in the City, Mithila knew there was no looking back. “I’d been involved with theatre for a while. I was also the festival director for Thespo,” she explains, heaping praise on mentors Quasar Thakore Padamsee and Toral Shah for helping her stay the course towards a career as an actor. I was just unbelievably fortunate to have met the right kind of people at the right time. Trained in Kathak and Hindustani classical music, performing was always her calling, but Mithila never imagined making it as a mainline star. “When I started off, I never planned anything. I had no idea of where life was going to take me. I was just happy to ride the wave.” Truth be told, it wasn’t an easy ride. With her grandfather being “hell-bent” on Mithila “not getting into the industry at all,” staying committed to her dream was a challenge. “I wish somebody had told me to just be fearless, have faith in myself and trust the journey,” she reminisces. “I’ve always believed that you can’t sit back and relax and expect life to just happen to you. If you have a goal, you need to figure out a way to get to it. If one experiment fails, you try something else… so I just kept going,” she says. Today, her persistence against all odds has finally paved the path for potential mega-stardom. “I never stopped to think I’d be considered a ‘brand’ some day and, even now, I only acknowledge it because other people tell me it is so. People look at me differently, but I am just the same. My biggest achievement is that I’ve converted my grandfather into my biggest fan,” Mithila laughs. From YouTube videos and web series after hit web series, to a feature film (2018’s Karwaan) with the inimitable Irrfan Khan, hers is the kind of reverse trajectory that one has only associated thus far with millennial icon Justin Bieber. Forget a godfather in the industry, or even a break via one of Indian cinema’s power-broking casting directors, Mithila Palkar’s most successful audition was a viral video — sans make-up, sans stylist and, not to mention, sans funding. Yet, here she is, making it to magazine covers and top lists everywhere, surrounded by an ecosystem of managers, publicists and stylists. Working on a film she cannot talk about (“producer’s orders”) and laughing all the way to the bank while she’s at it, Mithila remains mostly unfazed by it all. When pushed to confess to the perks of stardom she’s currently enjoying, the petite Ms Palkar is at a loss. “My favourite food is Indian Chinese, so it’s not like I am waiting to get into a restaurant where you simply cannot land a reservation,” she laughs. Priyanka Chopra. She’s an actor, a singer and a real star! She’s such an inspiration. I don’t track my ‘likes’ or online following. I am not so calculative. Keeping it real comes naturally because it is real. There’s no extra effort involved. Haters can hate, but I am unapologetically who I am. Ranbir Kapoor. And I was totally in love with Noah Centineo when I saw To All the Boys I’ve Loved Before, but that romance has ended (laughs). What is the first thing you notice in a man? I tend not to objectify people. I guess I’d notice a man’s personality. When was the last time you went out on a date? I’ve never had a Plan B, but I could opt for a career as a singer. Maybe I will look at that too, someday. That’s a long list! If only Gulzar saab still made films — I would die to work with him. Currently, I’d say Imtiaz Ali, Karan Johar, Zoya Akhtar and Meghna Gulzar top my list. I loved History (laughs) and hated Maths! Do you have a 3am friend? My sister. It helps that she lives in another time zone, so it won’t be 3 am for her (laughs). That’s simple. My grandparents keep me grounded. When was the last time you sang in the shower? I sing in the shower daily. It could be a Marathi song or something in English, but I’ll be singing for sure. Who tops your list of actors you’d like to work with? I’ve already had the honour of working with Irrfan Khan. Abhay (Deol) was really fun to work with. On my wish-list, at the very top, is Alia Bhatt. I think she’s amazing; one of the best actors we have in the country today. I follow most Indian stand-up comedians; notably Vir Das and Prajakta Koli. Her channel, Mostly Sane, is amazing. What’s the craziest fan encounter you’ve ever had online? I’ve received a marriage proposal on Facebook!